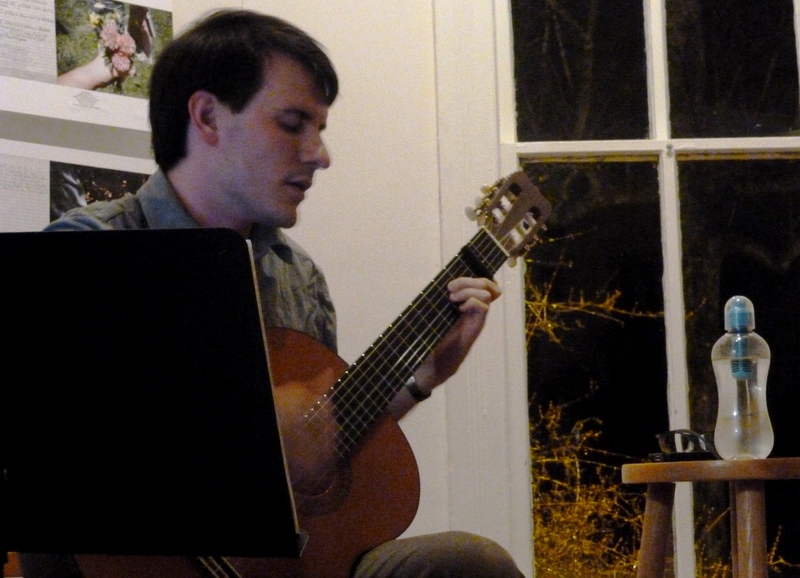 On February 14 at Stirling’s Coffee House, Trey Kennedy (T’16) played an assortment of love songs and “lone heart” songs to include everyone on Valentine’s Day. Playing everything from “Little Broken Heart’s” by Norah Jones, to a trio of flamenco pieces and “I Will Wait” by Mumford and Sons, Kennedy wanted to include a variety of tunes so that everyone heard something they liked. Starting at 7 p.m., Kennedy began the show by playing “Don’t Think Twice” by Bob Dylan. The mood was upbeat as Kennedy told stories in between songs and encouraged everyone to sing along to songs they knew. After playing songs like “Lion’s Mane” by Sam Beam of Iron and Wine and “For the Dog’s of Whoever” by Josh Ritter, Kennedy shared his long journey to playing the guitar and singing. Kennedy’s style focuses on “travis picking,” which means he uses his fingers to strike individual notes in a chord in various patterns, instead of simply strumming with a pick. Kennedy joked during the show: “That’s why I don’t sit on a stool and use a stupid strap!” Although Kennedy started with the violin and cello, his talent with a guitar was obvious as he got the whole crowd singing “Here Comes the Sun” in harmony. The next show will be titled something similar to “Songs for English Majors,” and will include songs that are also stories. Kennedy also hopes to include at least one original song that he just requires a title, and he is also working on the words to another song at the moment. This time next year, Kennedy hopes “to do a show that is mostly comprised of originals.” Kennedy’s combination of guitar, singing, and comedic side stories created a fun atmosphere that included everyone on Valentine’s Day.